Generation Dead is not your typical zombie novel. You won't find any half-rotting corpses slowly chasing their living prey. You definitely won't find a post-apocalypic wasteland, or a world ravaged by war and/or natural disaster.Instead, you'll just find an all-too-familiar high school cliche : popular kids vs. the outcasts.Not that I'm complaining, mind you. I found myself actually enjoying this untraditional take on a zombie story. Granted, there were several parts of the book that were a bit overworked, and I think that at least 20% of the content really should have been scaled back or removed, but overall, this was a decent first installment in a series that I plan on exploring further.I noticed that one of the more popular reviews on this book includes a huge comparison to Twilight, but I found almost next to nothing in common between the two books. Dead was written in third person, whereas Twlight was written in first. 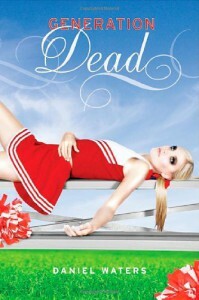 Dead had a more cynical, dry feel to it, and really didn't have any romance in it at all, other than one of the main characters secretly pining for his best friend. The book's own description of a goth girl that crushes on a zombie was just that - a light crush. There was no angsty obsession between those characters.Even though the book did have its dry moments, I was completely floored by the ending and have to know what happens next. I'm hoping that the next installment will pick up a little bit so I can throw out a 4 star rating the second time around.